I'm going to start playing Pokemon Y today, and I am still beyond torn. I love Fire starters (I'm a charmander at heart), but I've run them the last 3 games I've played. Also, the bonus pokemon is a Fire pokemon! So I'm leaning towards Froakie. But I'm kind of indifferent to frogs, and I like foxes better. I like porcupines, but an ultimate type of Grass/Fighting doesn't excite me at all, and I've always thought Grass starters were for chumps. And Froakie evolves in to a Water/Dark ninja! 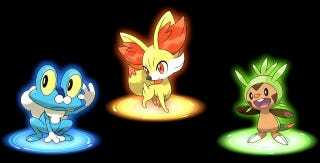 But Fennekin evolves into Fire/Psychic! And espeon remains one of my favorite pokemon of all time. In sum: I'm geeking out, help! Grass porcupine boxer, fire fox witch, water frog ninja. Which would you choose?